In the context of exercise/activity, a number of observations have been made in relation to chronic low back pain suffers (people who have suffered low back pain 12 weeks or more) There is strong evidence that exercise therapy is more effective than “GP care” for reducing pain and disability and promoting a return to work. When in pain we all have the “gut instinct” to rest. Too much rest is to be avoided. The body need’s to, and is designed to move!! With my help guidance and understanding you will see a great improvement in pain and mobility. Yes you will have good days and bad days; that’s normal. 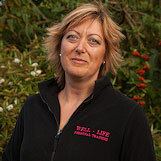 I will help you be more positive and stay active, with a carefully designed fitness programme. As a result you WILL get better quicker and have less trouble later.